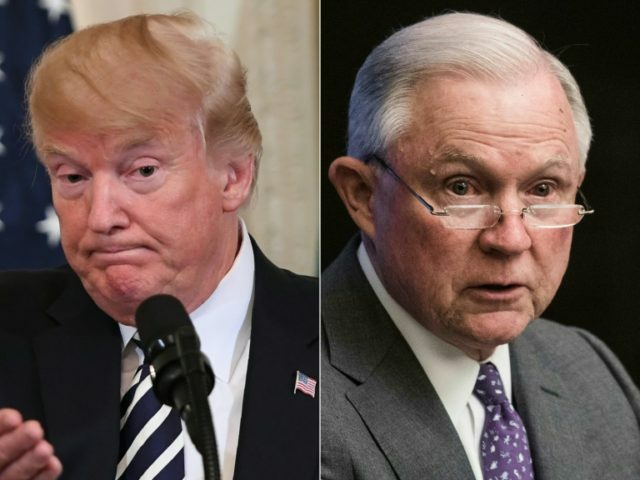 President Donald Trump criticized Attorney General Jeff Sessions Saturday for not acting to hold members of the Justice Department accountable. Trump cited reports about phony dossier investigator Christopher Steele meeting with Justice official Bruce Ohr, even after he was fired at the FBI. Conservative watchdog organization Judicial Watch filed a lawsuit against the Justice Department for communications between Ohr and Steele, as well as communications with Ohr’s wife. Fusion GPS hired Nellie Ohr to help investigate Trump for the dossier. “The big story that the Fake News Media refuses to report is lowlife Christopher Steele’s many meetings with Deputy A.G. Bruce Ohr and his beautiful wife, Nelly,” Trump wrote. “It was Fusion GPS that hired Steele to write the phony & discredited Dossier, paid for by Crooked Hillary & the DNC. “Do you believe Nelly worked for Fusion and her husband STILL WORKS FOR THE DEPARTMENT OF ‘JUSTICE,’” Trump marveled.